The Picture Butte Chamber of Commerce is awarding David and Teresa Feist with the title of Citizens of the Year. As they do all of their volunteering together, it was fitting that they shared the honour together, which is normally given to a single person. Both David and Teresa said they were surprised and humbled to receive the award. According to their nomination form, David and Teresa were “highly recommended”, and had volunteered on a wide variety of committees over the years, serving in “almost always a secretary” position. Additionally, the form cited them as being a great employee, and being excellent in staff courtesy and in customer service. 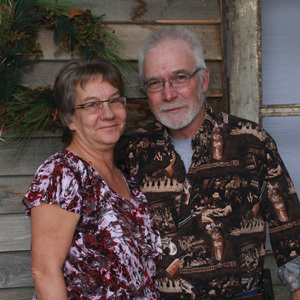 David and Teresa moved from Taber to Picture Butte in 1982, after David took a job in Nobleford. Since then, they have been involved with many different groups, initiatives and organizations, such as helping organize a babysitting co-op, the Picture Butte Fire Department where David was a member for over 30 years, Ag Society, Jamboree Days Bench Fair, canvassing door to door, Brownies, Transportation Society and the Prairie Tractor Society. “When we first moved to town, a babysitting co-op was organized, from there, we just went on to all the other organizations,” said Teresa. “We’re in this together. David said they first got involved in volunteering because their kids were in different activities that needed help to run. As their kids grew older, they began volunteering in other organizations throughout the community. David noted he was especially proud his volunteer work with the fire department, and during the time he was there, it had grown from “a handful of guys” to the service it is today. Teresa said that volunteering is a very rewarding experience, and they got to meet so many new friends while doing giving back to their community, noting that “everybody is always there for each other, and that’s what it’s all about”. “We worked with so many other people, and it takes all of these people and (their) dedication,” said Teresa. “Over the past 37 years, we have had the honour of working with many in Picture Butte, that we call our home. This community has always rallied together, been there for each other in times of need and connection, and that’s another strong point of what makes the community what it is. David and Teresa will receive their award during the Picture Butte Chamber of Commerce’s award diner, which will take place on Friday, Jan. 18.